Dave Splash Dot Com: Willie Nelson Markets 'Bio Willie' Fuel -- No Saudis or Bushes Involved! Willie Nelson Markets 'Bio Willie' Fuel -- No Saudis or Bushes Involved! I know you right-wingers out there hate when liberals talk about ways to become less dependant on foreign oil. I get it. Drill. Drill. Drill.You like things just the way they are, and think that it is perfectly acceptable for a few thousand Americans to die so you don't have to change your lifestyle one bit. Well some liberal (a musician nonetheless) is marketing a way to fuel cars and buses with an oil that comes from crops grown right here in the USA. 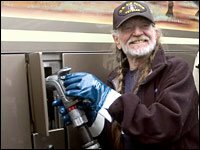 That liberal is Willie Nelson, and he is producing a form of fuel - Biodiesel - that is run from oil generated from American agricultural products. No Saudi Arabia. No Halliburton. No friends of W. Sorry Republicans, there is no way for you to get rich from this -- but it is good for the country, the environment, the economy, and best of all, no one has to die for it to be produced. So how about putting the nation's interests ahead of your own and supporting this fuel. In Texas, biodiesel costs only four cents more per gallon than regular diesel. That is hardly cost prohibitive. (New York Times) Willie Nelson drives a Mercedes. Good for Willie. Nothing would be niceer than taking profits away from both Big Oil and the Middle Eastern despots. Willie's great, and I don't think right wingers can attack him. Everyone loves Willie Nelson.